Bawwwww, widdle Hulk went boom boom. From all I’ve heard and read I’m really excited to see The Avengers movie when it comes out this Friday. It really does sound like they didn’t mess it up at all where they really could have. Still, I’ll judge that when I see it. But for now, I’m going to get my infected self to bed and hope the NyQuil does it’s job. 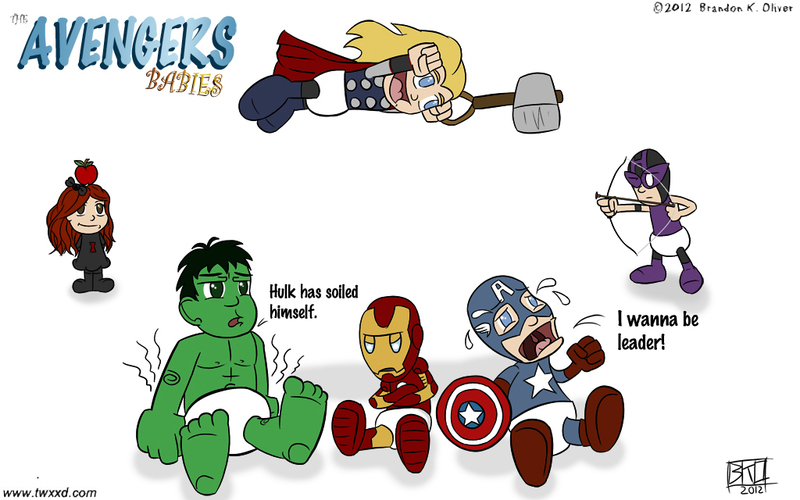 Earth’s Mightiest Toddlers! Absolutely darling, Brandon! Good job! Read from a few asian reviews that it’s good. Here in Vegas, we got a Marvel marathon, $30 to see all the Marvel movies then at midnight, Avengers. Just so much adorable here! I love it! And I would absolutely watch a show about the Avengers Babies. Thanks so much! Yeah, I hope Marvel/Disney are taking notes. This looks like an adorable idea. Would baby Tony Stark still drink too much? I think iron man needs those diapers on the INSIDE..hahah Boy is that going to be messy. Episode one. Who took Iron Man’s apple juice? I see a lot of crying and toys being thrown happening in that one. Avengers assemble… after your nap! You wouldn’t want baby Hulk to get cranky! Seriously, I have high expectations for the Avengers… I’m a big fan off all things Joss Whedon! Me too, I can’t wait. Some people would pay good money to smell the Hulk diaper. I’m not saying who, but I know people. This is so awesome, it’d make a great poster! As long as Hulk doesn’t burst outta that nappy. This comic made me think of Rugrats, love that cartoon. Captain America looks like Tommy Pickles.